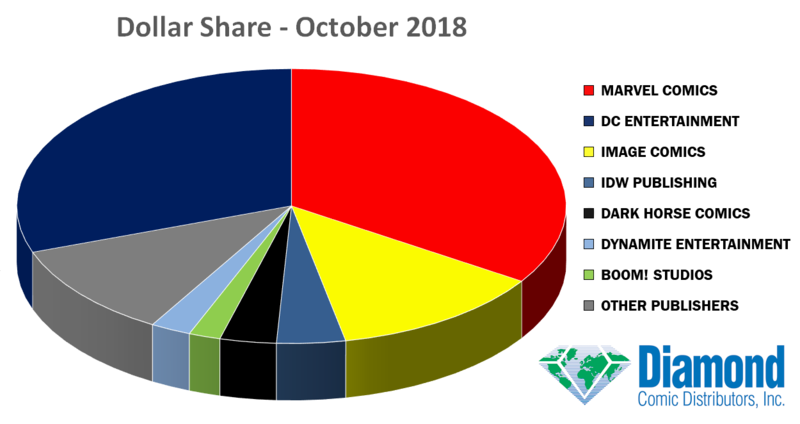 Diamond released their sales info and charts for October 2018, which includes Marvel coming out on top in terms of units and dollars sold. 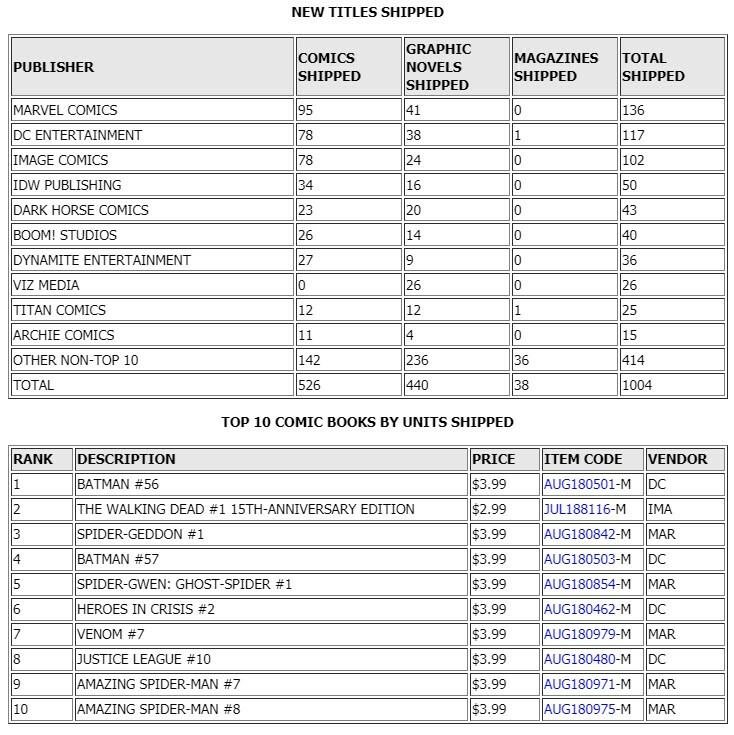 DC Comics does take the top spot with Batman #56 followed by Image Comics' The Walking Dead #1 15th Anniversary Edition. 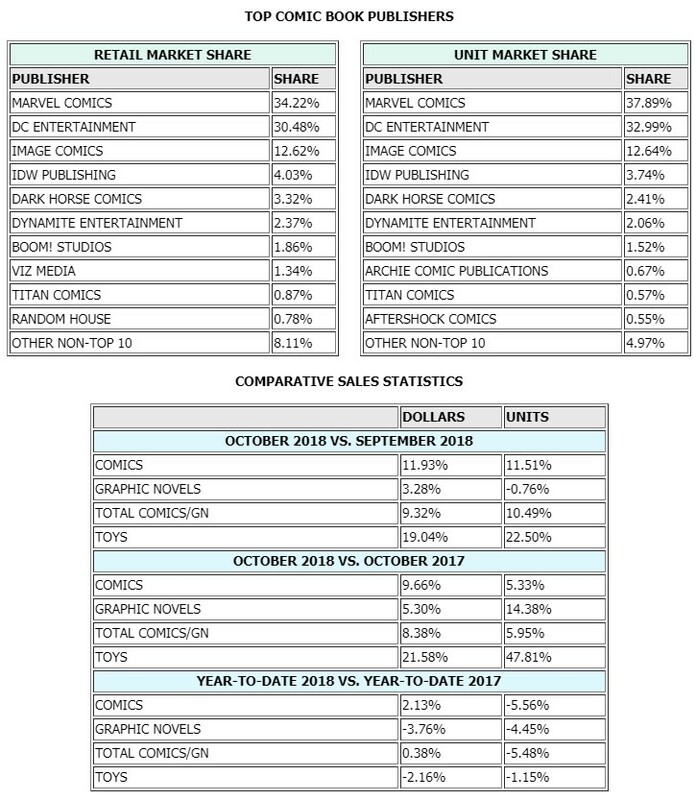 Marvel Comics was October's top publisher with a 34.22% dollar share and a 37.89% unit share. DC Entertainment was second for the month with a 30.48% dollar share and a 32.99% unit share. 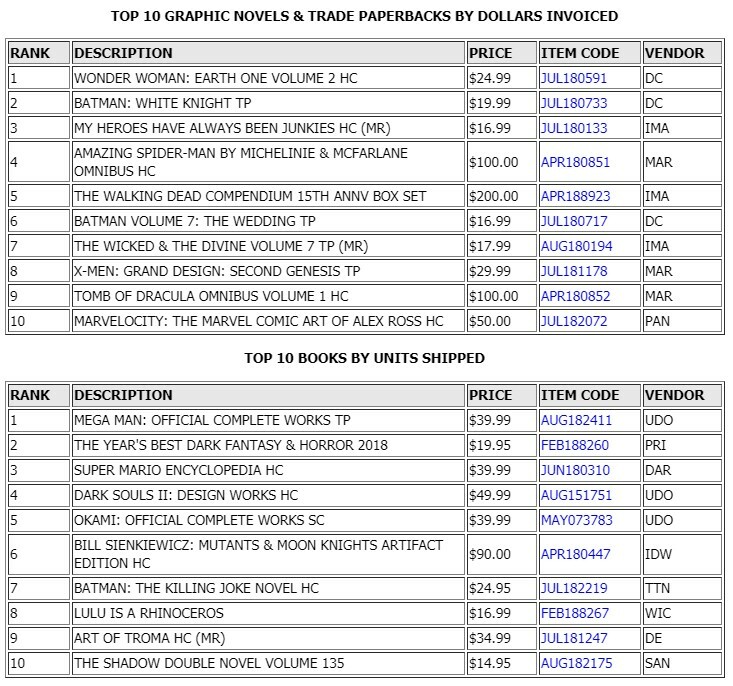 Image Comics was third with a 12.62% dollar share and a 12.64% unit share. 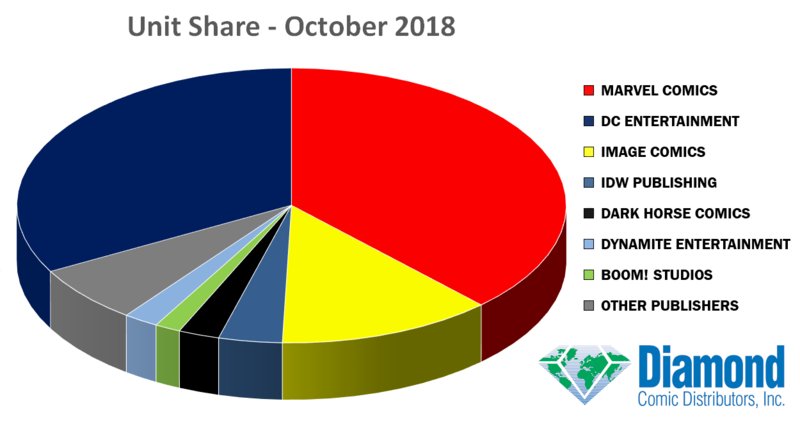 In fourth was IDW Publishing with a 4.03% dollar share and a 3.74% unit share, followed by Dark Horse Comics with a 3.32% dollar share and a 2.41% unit share, Dynamite Entertainment with a 2.37% dollar share and a 2.06% unit share, and BOOM! Studios with a 1.86% dollar share and a 1.52% unit share. 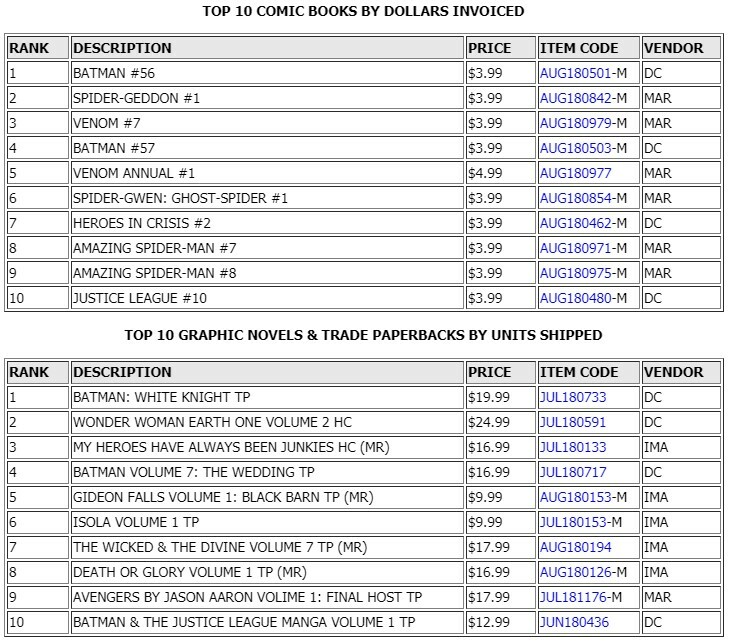 In total, DC Entertainment had four titles in the top ten. In addition to Batman #56, King and Daniels' Batman#57 ranked #4; Tom King, Clay Mann, and Travis Moore's Heroes in Crisis #2 ranked #6; and Scott Snyder and Francis Manapul's Justice League #10 ranked #8. Image Comics' The Walking Dead #1 15th-Anniversary Edition, a reprint of the first issue of Robert Kirkman's legendary zombie comic for October's Walking Dead Day, ranked #2. Marvel Comics had five titles in the top ten, led by Christos Gage, Dan Slott, and Jorge Molina's Spider-Geddon #1 at #3; followed by Seanan McGuire and Rosi Kampe's Spider-Gwen: Ghost Spider #1 at #5; Donny Cates and Iban Coello's Venom #7 at #7; Nick Spencer and Humberto Ramos' Amazing Spider-Man #7 at #9; and Spencer, Ramos, and Victor Olazaba's Amazing Spider-Man #8 at #10. Among the premier publishers, Dark Horse Comics' Stranger Things #2, based on the Netflix series, ranked #63; IDW Publishing's Batman/The Maxx: Arkham Dreams #1, a crossover with DC Entertainment, ranked #64; BOOM! Studios' Mighty Morphin Power Rangers #32 ranked #160; and Dynamite Entertainment's KISS: Blood and Stardust #1 ranked #216. Sean Murphy's Batman: White Knight, a collection of the best-selling DC Entertainment mini-series in which The Joker, reformed, is Gotham City's hero, was October's best-selling graphic novel and one of the publisher's four books in the top ten. Image Comics had five books in the top ten, led by Ed Brubaker and Sean Phillips' original graphic novel My Heroes Have Always Been Junkies at #3. Marvel Comics' Avengers By Jason AaronVolume 1: Final Host, a collection of the first story arc of Aaron's Marvel Legacy run on the title, ranked #9. Based on their best-selling online team shooter Overwatch, Blizzard Entertainment's Overwatch: Mercy 12-Inch Statue was October's best-selling toy product. 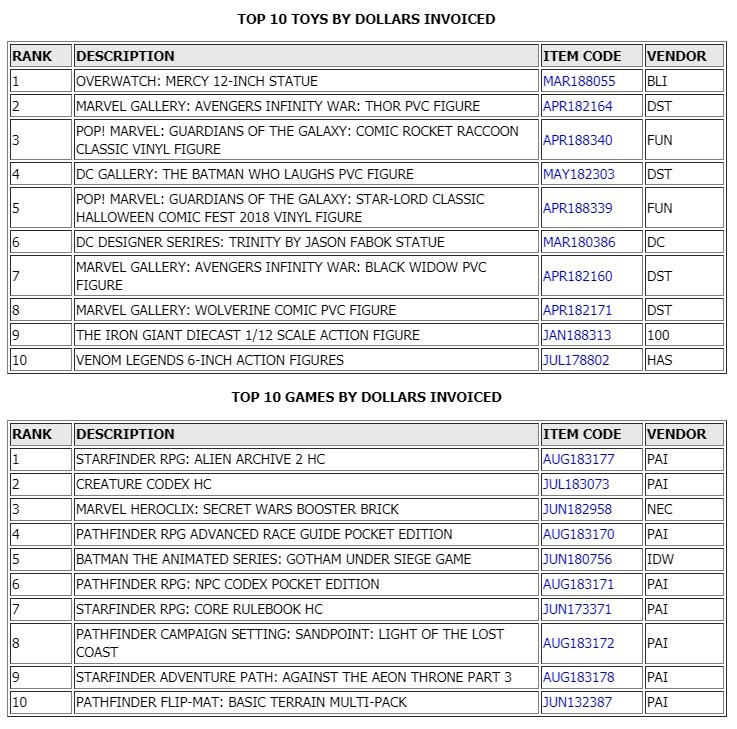 Diamond Select Toys had four products in the top ten, led by the Marvel Gallery: Avengers Infinity War: Thor PVC Figure at #2. Funko had two PREVIEWS Exclusive products in the top ten: the POP! Marvel: Guardians of the Galaxy: Rocket Raccoon Comic Vinyl Figure ranked #3, and the POP! Marvel: Guardians of the Galaxy: Star-Lord Classic Vinyl Figure, produced for Halloween ComicFest, ranked #5. DC Collectibles also charted in the top ten; the DC Designer Series: The Trinity by Jason Fabok Statueranked #6.